Create rapport quickly and communicate better through understanding what facial structures indicate about yours and your clients preferred communication style. Misunderstandings can happen so easily. ?What if you have a different focus depending on how close your eyes are set? ?Some need all the details and some want the bottom-line. Your face speaks louder than words! It gives us a key to understanding each other better. 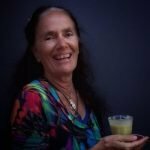 Parijat Wismer runs the Byron Kinesiology Centre and the Kinesiology School Campus in Byron Bay. She has over 30 years’ experience in helping people be well physically, mentally, emotionally, nutritionally and energetically. Good communication is essential for our well-being.